Title: 'An Accurate map of the British, French and Spanish Settlements in North America and the West Indies as stipulated by the Parliamentary Articles of Peace signed at Fontainebleau by the Ministers of Great Britain, France and Spain. November 3rd 1762'. 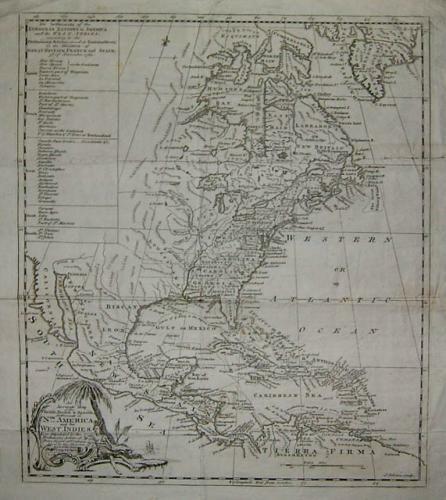 A very rare map showing the colonial division of North America after the Seven Years War. There is a table listing the principal settlements of each nation including the Dutch and Danish along with the 'big three'. In good condition on clean paper, with folds as issued. There are a couple of small tape reinforcements on the folds at the verso and a small hole ( 1 mm) at the centerfold.